Most bison calves are born in mid-spring. However, one August morning at the Konza Prairie Biological Station near Manhattan, Kansas, a new little orange-coated bison is discovered within the herd. The people who manage the herd become concerned about her welfare, as they know that since she is so little she faces many challenges to survive the winter in the tall-grass prairie of the Flint Hills. Will she survive the harsh winter so she can learn to munch fresh new grass with her mother in the spring? 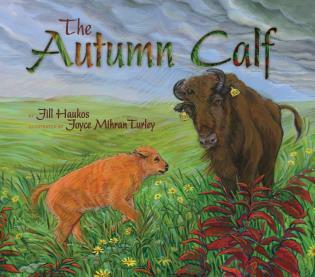 This beautifully illustrated book takes the reader through a year on the tall-grass prairie with the bison herd, where we learn about bison management practices, the local plants and animals that grow and live in the ecosystem, and the importance of controlled burning to keep the native prairie grasses healthy and remove invasive species. Jill Haukos has lived on the prairie her whole life, starting in South Dakota and then moving to west Texas and then finally, the Flint Hills of Kansas. With her job at the Konza Prairie Biological Station she has had the opportunity to combine her two great loves: nature and teaching. She and her husband Dave have one daughter, Katie, and they all enjoy life on the prairie. Joyce Mihran Turley has illustrated many children's books depicting unique ecosystems, including two other books in the LTER Schoolyard Series, One Night in the Everglades and And The Tide Comes In: Exploring a Coastal Salt Marsh. She lives with her husband Rick in Fort Collins, Colorado.